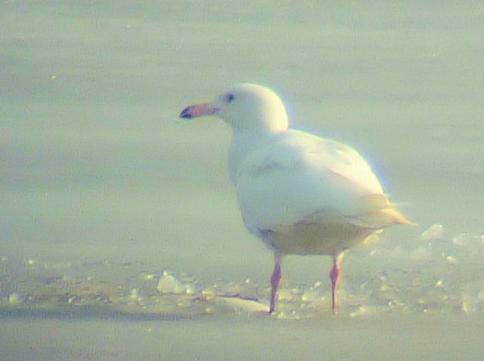 Description: Immature Glaucous Gull fighting with a dead fish partially frozen in the ice. April 25, 1965. Two observed in Casey Township by members of the Kirkland Lake Nature Club. December 22, 1998. One observed at during the Christmas Bird Count at the New Liskeard Dump. December 15, 2001. One observed at Haileybury Dump by Barry Kinch. April 24, 2008. One immature observed and photographed by Gertrude Trudel in Gowganda. December 6, 2008. Six immature gulls observed and photographed by Michael Werner at the New Liskeard Marina..